Our Amish quilts are still made the old-fashioned way one stitch at a time. Patterns are designed from traditional Amish styles. They do take more time and are more expensive than machine processed quilts. There’s just something special when they are handmade with a labor of love, especially when they will likely become a family heirloom. Each quilt is custom made per order allowing a wide choice of different colors to match modern day décors. 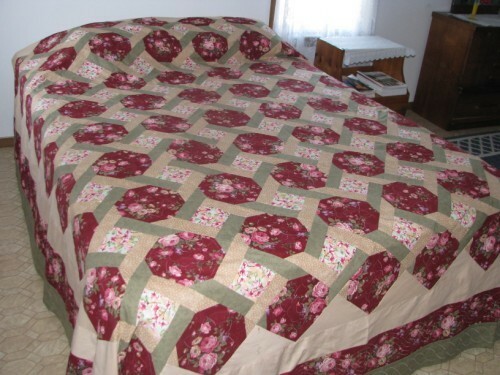 Custom quilts can also be made from your own pattern design. Hand sewn quilting service is also available for those who have assembled their own quilt block top. Just drop us an e-mail for other custom quilt work. Our Amish quilts are based on the following mattress sizes. Please let us know if you need a special size and we will gladly send you a quote. Our process is unique in that each quilt is custom made with each order just for you. This allows you a wide range of color options to fit your needs and personal taste. Please allow up to 3 months for your quilt to be made and shipped. If you have a particular pattern or a picture of a favorite heirloom quilt you would like have made please let us know. If you need a particular odd size not listed please let us know that as well for special quotes. The quilt blocks are sewn together. Once all the quilt blocks are attached they are stretched over a large rack and the actual quilting process is hand stitched. The hand-stitched quality and the time it takes to complete is what sets these quilts apart from any other factory made quilt. There're many imported quilts being sold in the U.S. but a close look and counting the stitches will quickly determine hand sewn or machine sewn. This is why the Amish made quilts are known for their heirloom quality. Please select the size and the main color theme you are wanting, such as blues, reds, maroon, burgundy, greens and etc. The Amish lady who makes these will use her judgment and knowledge to hand select contrasting colors to go with your main theme. Each quilt is unique and may not have the same fabric patterns as the next. If you’re not comfortable and have plenty of time, we will let her select the colors she plans to use and send them to you in small swatches. These are custom quilts and won’t be able to be returned. We will work with you to have every opportunity to be sure the quilt matches your vision. Again no two quilts will have the same material patterns. If you have to have a perfect match, we ask that you choose the option to send in your own fabrics.